While the Oconee County Chamber of Commerce provided Epps Bridge Centre developer Frank Bishop the platform to go public with his campaign for liquor by the drink in the county, the Chamber has taken a much weaker stand itself. Bishop, the keynote speaker at the Chamber’s Banquet and Annual Meeting last Thursday night, asked the Board of Commissioners to put the issue on the ballot and the public to vote to allow restaurants to sell liquor. Jonathan King and Jonathan Schwartz, 2013 and 2014 Chamber chairmen respectively, sent the members of the BOC a letter on Jan. 9 saying that the Chamber “wholeheartedly believes that the citizens and the business community should have the opportunity to vote on ballot questions that can impact our way of life. The letter makes no reference to alcohol and does not specify what the “issue at hand” is. Chamber President Kay Keller told the more than 300 persons at the banquet that she had spent about two hours with Bishop helping him prepare his remarks for the evening, the centerpiece of which was his call for a change in the county’s liquor laws. Bishop’s call received applause from only a portion of the audience, and it lasted only six seconds. The Chamber does not serve alcohol of any type at its events, and participants on Thursday night were offered only sweet tea and water to drink when they picked up their food from the buffet line at the Civic Center. Oconee County Commissioner John Daniell, in response to a request I made of him, provided me with copies of the Chamber letter as well as of five other letters he said he and other Commissioners had received on alcohol sales. Bishop himself sent the Commissioners a letter on Oct. 24 of last year requesting that they “consider placing a referendum” on the ballot on Nov. 4, 2014, to allow the sale of liquor in the Epps Bridge district and others districts in the county. Bishop repeated these arguments in his presentation to the Chamber at the banquet. Peake, a Republican member of the Georgia House of Representatives and secretary/treasurer of the House Majority Caucus, has been in the news recently because of his support for legislation allowing for the medical use of marijuana. He signed his letter to the Commissioners noting his political positions. Peake’s email message was posted at 9:19 a.m. on Sept. 26, and Oconee County BOC Chairman Melvin Davis wrote back to Peake in an email message posted at 11:55 a.m. that same day. Davis voted to break the tie to allow the sale of beer and wine in Oconee County restaurants in 2008. Commissioners Don Norris and Jim Luke voted in support, and Commissioners Margaret Hale and Chuck Horton voted against. Commissioner Daniell has replaced Norris, who has passed away. Commissioner Mark Saxon has replaced Horton, who unsuccessfully challenged Davis for BOC Chairman two years ago. Daniell and Hale have expressed opposition to a referendum in telephone conversations with me last month and this. David Zerkel, 1161 Planters Ridge Drive in the northwest of the county and an associate professor of tuba and euphonium at the University of Georgia, sent an email message to Davis on Oct. 23 asking that the county allow voters this year to vote both on liquor by the drink and on Sunday sale of alcohol. The county’s current ordinance do not allow any type of alcohol to be sold on Sundays. Zerkel expressed disappointment that Epps Bridge Centre had attracted mostly discount retailers. “I think that many residents had higher expectations from this shopping center,” he wrote. “The best and most honest way to check the pulse of the community is a referendum vote, so that each of our residents have a say in the process,” Zerkel wrote. Oconee County voters turned down liquor by the drink three times, most recently in 2002. The first, he said, is shop locally, and he pointed to a button on his lapel saying “Go Local.” All of the businesses in Epps Bridge Centre with one exception, however, are national chains, regional chains, or franchises of national chains. The exception is the single restaurant, Taqueria Tsunami, scheduled to open later this year. The company, which has a license to sell beer and wine at the Oconee County site, is based on Atlanta. The Epps Bridge Centre store will be only the company’s third outlet. Bishop’s second request of the banquet participants, which included Commissioners Daniel, Davis, Luke and Saxon, is to put the referendum on the ballot and to pass it. Bishop said he cannot attract the kinds of restaurants he wants and needs in his shopping center without the change in the law. “Quality restaurants help attract quality businesses, quality hotels, who generate higher sales tax revenue to support the quality of life in Oconee County,” he said. “The opportunity exists for there to potentially be a convention-style, business-type hotel,” he told the group. Bishop, unlike the Chamber, was calling not only for a referendum, but for a positive vote on liquor sales in restaurants. The simpler way for the issue to be put on the ballot is by a vote of the Board of Commissioners. Citizens can accomplish the same end by petition. Georgia law says that a written petition containing "signatures of at least 35 percent of the registered and qualified voters" is required to obtain the referendum. The number of registered voters in September was 24,689. That number varies, but 35 percent of that figure is 8,642. I attended the Chamber banquet to hear Bishop speak. I was at the back of the room and given a chance to go to the buffet line late. Chamber President Keller introduced Bishop before I had finished eating. I turned on an audio recorder as Bishop started to talk and switched to a hand-held video recorder four minutes into the nearly 35-minute-long presentation. 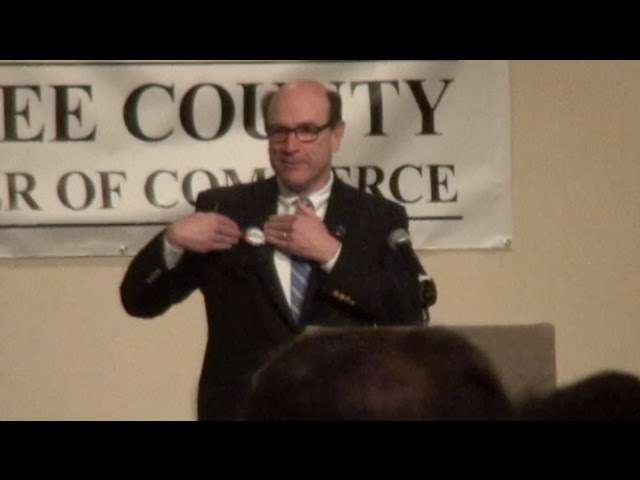 I combined these two, and the complete keynote address by Bishop is on the Oconee County Observations Vimeo site, though the quality of the video and audio is low. 1) I'm guessing Mr. Bishop has Melvin Davis on speed dial. I'm also guessing that non-county resident Mr. Bishop holds a lot more sway with Melvin and the CofC than any county resident does. 2) CofC President Key Keller spent 2 hours prepping Bishop?? Guess we know where she stands on alcohol by the drink. Peake doesn't represent Oconee County. Why is Melvin asking him about alcohol by the drink? "The first, he said, is shop locally, and he pointed to a button on his lapel saying “Go Local.” All of the businesses in Epps Bridge Centre with one exception, however, are national chains, regional chains, or franchises of national chains." Epps Bridge is an ugly glorified strip mall of national retailers, and carpetbagger Bishop is telling people to shop locally. Time to shop locally, Mr. Comic Shop and Chops n Hops! "Shop locally" means shop where you live. Doesn't have anything to do with where the stores are from (national or regional). He's saying you should spend your money in the state, county and/or city that you live in to support your location. Anon 10:55 is wrong, wrong, wrong! Shop locally means support your locally-owned business. These businesses are locally owned, and in theory your spending goes right back into the local economy & supply chain instead of some far off corporate headquarters, Wall Street, stock holders, etc. It means shop at Luke Hardware instead of Home Depot, eat at Chops 'n Hops instead of Applebee's.